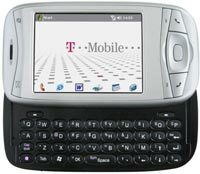 T-Mobile MDA is built based on the design of HTC Wizard, which has also been launched as MDA Vario in Europe and as a variety of brand name such as O2 Xda Mini, i-Mate and Cingular 8125. T-Mobile MDA is powered with 200 MHz TI OMAP850 processor and runs on Windows Mobile 5.0. T-Mobile MDA Vario also has a large 2.8″ touchscreen LCD, equipped with 1.3 megapixel digital camera, QWERTY thumb keyboard, and supports Bluetooth 1.2, 802.11b/g Wi-Fi, Quad-band GSM, GPRS and EDGE (Class 10).